A Microchip PICStart Plus or a clone PIC programmer? 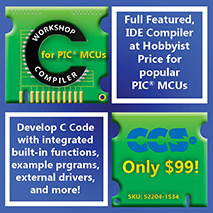 When I wanted to buy a programmer for PIC micros, the first choice was a PICStart Plus, the official programmer for PIC micros, from Microchip. I was told by the distributor that this is the best bet - he said it is more likely to work reliably than the clone programmers. But, is this correct in reality? Astonishingly, the clone programmers PICALL and P16PRO, perform better than an official PICStart Plus. The PICALL supports the 12X and 16X series PIC micros, and the cheaper P16PRO supports everything except the parallel-programmed PIC16C5x, which is quite rare anyway. They work beautifully. The designer, Boban Dobaj, has been working on it since 1995 and due to the amount of orders he gets, is continually updating it. He's had more than a few hundred thousand hits on his website, and has sold thousands of his programmers worldwide. The PICStart Plus is guaranteed to work with all future PIC micros. However, with the PICALL and P16PRO, even if future micros are released, the configuration file can be changed so it will work with them. With the amount of effort Bobaj Dobaj is putting into it, the PICALL and P16PRO are going to be supported well into the future. Software is reasonably good, its been maturing for more than 10 years. Supplied software is excellent, its been maturing for 5 years. It programs faster, by about 30%, compared to a PICStart Plus. If the program is smaller than the maximum, it skips the unnecessary bytes. This speeds it up immensely, for small programs it takes a few seconds instead of a few minutes. Its cheaper, by a long way. It doesnt crash all the time like MPLab. If the PIC micro is bad, it tells you instantly, rather than just pausing for 5 minutes than crashing. This programmer will support future PIC micros, with a change to the .ini file. 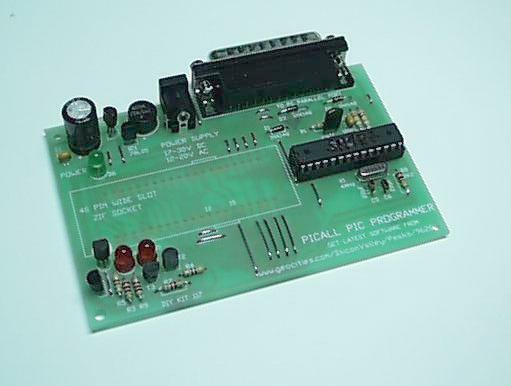 The PICALL also supports some EEPROM chips and a few Atmel chips also. This list will grow as the software is updated. The distribution network is reliable, there are over 10 distributors world wide. I ordered both the PICALL and P16PRO from Hong Kong and 3 days later had it. I assembled them, and they worked first time. Its the little things that make using a PICALL so much less frustrating than an MPLAB and PICStart Plus combination. There is auto-load of the .hex file on startup. One key programming. Every feature can be accessed by pressing one function key. There is a super-fast DOS version, as well as a windows version. As I have said, the clone programmers PICALL and P16PRO, overall, perform better than an official PICStart Plus. What about the Pro Mate II ? The Pro Mate II is the production programmer available from Microchip. It is quite expensive, but it has a few advantages. For one, it programs and verifies at multiple voltages. The PICStart Plus, PICALL and P16PRO only program and verify for running at one voltage, +5V. Thus a PIC programmed with these programmers is only guaranteed to run at +5V. This does not really make a difference, however for absolute theoretical reliability it might. It does gang programming also, a great advantage for saving speed. And what do others think? "I am a user of the P16PRO programmer. I agree that it is economical and much, much faster than a PICSTART ! I had to use a PICSTART at a client's site and I thought something was wrong with it ! I was only loading a small (<200word) program and it took a long time to do it. I have used my P16PRO to program a variety of PICs with no problems whatsoever. The software and hardware work extremely well. As a professional, I don't have time to troubleshoot someone else's devices. It is important that things work solidly and reliably. This is definitely the case with the P16PRO. Sometimes the cheap "hobby" tools cause more trouble than they're worth. This is not the case with the 16PRO ! I recommend it to anyone interested in a PICSTART PLUS alternative. The only item which needs to be addressed is the support for PIC 17's and 18's. I use a PICSTART16B1 for my 16c5x programming, and it works fine, but I use the P16PRO for everything else." We've been using the P16PRO programmers as production programmers at our business for 12 months now. They dont verify at anything other than 5V (compared to the ProMate II) but since our devices only run at 5V, its no problem. For non-continuous operation, they work perfectly. For continuous programming operation (more than 5 devices in a row in one session) we found that we had to change the existing regulators for 5V and 8V (74L05 and 74L08) from 100mA to the larger 1000mA versions (7405 and 7408). The rating of 100mA was just not enough. We have had one 7406 buffer chip blow up, but that was after 400 programming runs over 8 months. It was 5 minutes and a few dollars to fix it. Not bad considering the workload!